A long standing resident of Santa Cruz County, Anna Montoya-Paez has been practicing law since 1990. 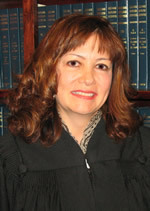 Judge Montoya-Paez received her undergraduate degree in Political Science and her law degree – both from the University of Arizona. Prior to taking the bench as the first female Judge elected to the Santa Cruz County Superior Court, Judge Montoya-Paez spent 11 years defending clients in various legal categories. Her practice encompassed, but was not limited to, Litigation, Domestic Relations, Criminal Defense, Personal Injury, Estate Planning and Probate, handling cases in both State and Federal Courts. She was honored with the Athena Award, the Nogales/Santa Cruz Chamber of Commerce Award for outstanding Business Woman of the Year. Judge Montoya-Paez has served on the board of the Chamber of Commerce, the Boys & Girls Club, Zonta and the Woman’s Club. She has given of her time by volunteering for the GEAR-UP Program, We the People Program, Southern Arizona Law Enforcement Center, Zonta’s Girls Leadership Training, Desert Shadows Middle School Band Boosters, Nogales High School Band Boosters and Santa Cruz County Advocates for the Arts. She also has been asked to speak before various civic groups. Judge Montoya-Paez also has been a guest speaker at the Arizona Women Lawyer’s Association State Convention, the annual conference of the Arizona Association of Family Conciliation Court, American Bar Association annual conference and has participated at the National Association of Latino Elected Official’s Institute. She was appointed by Governor Napolitano to serve on the Juvenile Task Forces and appointed by the Supreme Court to serve on the Commission of Victim’s Rights. Judge Montoya-Paez is currently serving her fourth term as Superior Court Judge of Santa Cruz County. Her husband is Raul Paez, a local business owner. The couple has three children.